Well, so that's it for HD DVD. Just Google News on HD DVD, and you will see that its demise is official. Of course, it's only Toshiba abandoning the format, but without Toshiba the format is nothing. Interesting parallels: Betamax was the first to market in the US, but it lost out to VHS. HD-DVD was the first to market in the US, but it lost out to Blu-ray. Betamax had a lower capacity than VHS (ie. a shorter recording time). HD-DVD has a smaller capacity than Blu-ray (15GB vs 25GB for single layer. But, to be fair, Toshiba did suggest the introduction of a 51GB triple layer HD DVD, which would be bigger than the 50GB dual layer BD). And those parallels are, of course, meaningless. Two vaguely comparable incidents in a thirty year period are not something upon which one ought to hang a trend. I'm reviewing a high definition digital TV receiver/PVR that, like most of them, doesn't have the ability to output 576i over HDMI, nor to perform decent deinterlacing of it. To confirm my suspicions I took some photos. Having taken them, I thought I might as well put them here. 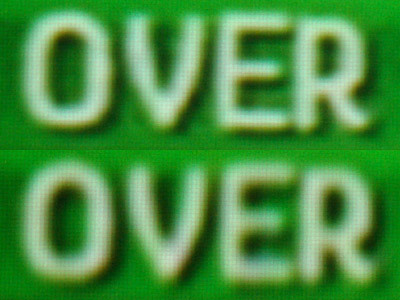 Top is taken from the score box displayed during a cricket match, output over HDMI at 576p by HD PVR, but reprocessed by an iScan VP50Pro to turn it back into 576i and then deinterlace and scale it properly. Bottom is the same score, but without the benefit of the reprocessing. These kind of differences writ large over a full projection screen make a significant difference to the picture quality. One of the interesting side effects of digital home entertainment equipment is that products are no longer set in concrete. It used to be that you'd buy some gadget or other and what you purchased you were stuck with. If there were things you didn't like about it, then you simply had to cope, or sell the item off and buy something else. But these days the operating logic of much home entertainment equipment resides in (I think) EPROM (electronically programmable read only memory, although they may simply use some form of flash memory these days). So your device is no longer static, but can improve over time -- if you install the firmware updates. Take, for example, the Samsung BDP-P1400 Blu-ray player. This is remarkably cheap for a Blu-ray player ($769 RRP in Australia), yet it can deliver 1080p24 and all the different audio standards as bitstreams over HDMI. It has worked well on the eight or ten Blu-ray discs I've used it with. Except that at 1080p24 it skipped the odd frame, seemingly randomly. Sometimes you'd go twenty minutes without any problems, but then you'd have a jerk in the video happen several times within a few minutes. So I upgraded the firmware. With the Samsung you can plug it into your home network and have it do the upgrade itself, or you can download the new firmware from Samsung, burn it to a CD and load it that way. I actually did both. When I had finished, the jerk had gone away. Samsung had corrected it with programming improved firmware. This kind of thing happens with most new generation digital devices. Toshiba regularly issues updates for its HD DVD players. I recently reviewed a Sony Blu-ray player and for it to work properly with some discs, it also needed a firmware update. Ditto for Pioneer. Also for many digital TV receivers and personal video recorders. I've even done it with three different DVD players. Disadvantages? Well, there must be a temptation to get products out the door sooner, before they are fully debugged, since they can fix them as time goes on. 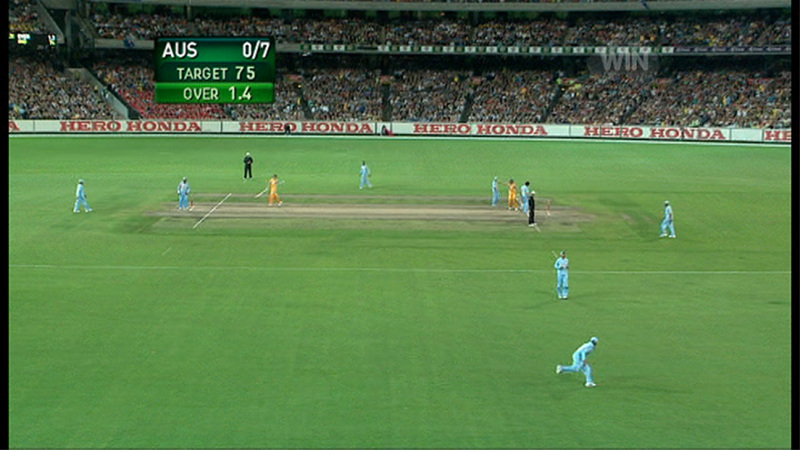 At long last the first cricket match to be delivered in high definition in Australia was broadcast. 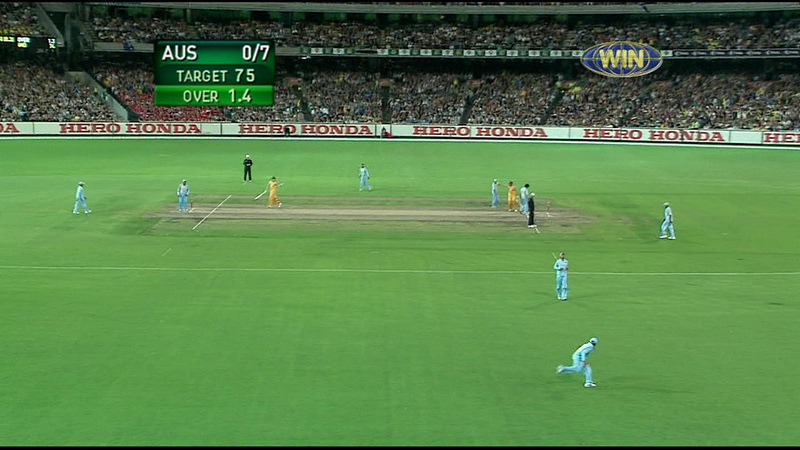 This was the 20/20 match between Australia and India, played at the Melbourne Cricket Ground. Australia won handsomely. Let us have a brief look at how these compared. First there are the full frames: HD at the top, SD at the bottom. You will notice that for some reason the SD picture is cropped a little to the left and right, whereas the HD picture extends to the extreme left and right of the frame. But how does the picture stack up in an overall sense? First, there was a fair bit of MPEG macro blocking from time to time on the HD picture. In comparable places in the SD picture, there was none. This tended to occur during extremely complex scenes (such as horizontal pans across the crowd, and during a strobe light sequence while the band was playing between innings.) I did notice one severe example during a replay of a closeup of a player running fast. Aside from that, the HD image was much, much better. Mind you, I was watching this with a front projector (the new Sony VPL-VW200, LCoS, full HD - it still isn't on Sony Australia's website). The whole thing was much easier on the eye, with excellent detail. In the closeups to follow, you might see a little MPEG noise. This wasn't noticable on screen. Basically, the picture just seemed more coherent, hiding the parts of which it was composed, unlike the SD image which made it clear that this was a slightly blotchy capture of something happening far away. Now let us look in more detail at just one detail. 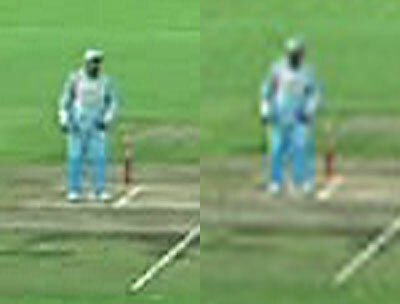 This is a zoomed in detail showing the Indian cricketer at the left hand end of the wicket near the stumps. 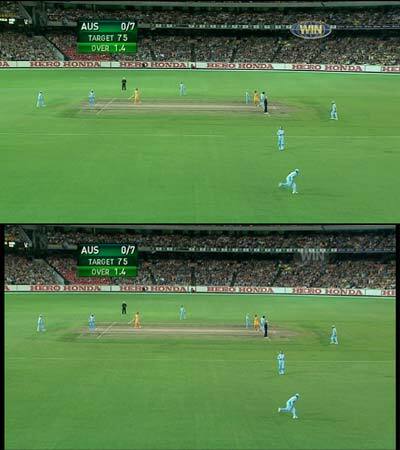 You will see that on the left side (from the high definition image) that he is looking down the pitch. On the right side it is impossible to see what he is doing. In fact, if anything, it looks like he is facing towards the camera. Obviously the other details are also far sharper in the HD image. By the way, in creating these pictures, I imported digital recordings from a Beyonwiz DP-P1 HD PVR directly into my computer via the network. I found comparable frames in the HD and SD versions. I copied those frames into Photoshop. Then I deinterlaced both of them using even fields and interpolation. I then scaled the SD version from 1,024 by 576 pixels up to 1,920 by 1,080 pixels, since this is what a HD display device would do. For these details, I cropped down to the relevant details and then doubled the size of them to make them easier to see on screen. If you want to do closer comparisons yourself, the two original frames (except that the SD has been scaled up in size and both have been deinterlaced) are here for the SD, and here for the HD. These are about 400kB each. I'm checking out the audio decoding capabilities of the Pioneer BDP-LX70A Blu-ray player and the Yamaha RX-V1800 home theatre receiver. To help me I have Dolby Laboratories' Blu-ray demo disc, 'The Sounds of High Definition'. After I had done my checks, using specific tracks, I just left it running while I was writing something. After a while I noticed a series of powerful thumps that didn't seem to relate to the music (a bit of light Mozart) that was playing. This was during selection 3 of the Dolby Digital Plus demo material, entitled 'Elements: Air, Earth, Snow, Water'. It was at the start of the 'Snow' section (about 1:20 into this selection). I went closer and had a look at the subwoofer I am using this week, the REL R-305, which didn't have its grille on. The driver was pushing huge amounts of air, visibly displacing by a centimetre or so, and then tailing off slowly. The sub happened to be plugged into my power meter, which was flicking to 50 or 60 watts during these pulses. So of course I measured the LFE signal by plugging the receiver's LFE output into my computer. Why is this there? Is it a 'heart beat'? Or a mistake? As mentioned in the last item, I've been working on a roundup of all HD disc players. One of these is the Panasonic DMP-BD10A, now priced at just $1,099. I have been drilling down into what capabilities the various audio decoders of each player have and, in my initial draft, I accused the Panasonic of only decoding Dolby TrueHD to 5.1 channels, even if the source was 7.1 channels. But there were two things that made me hold back. First I had this niggling suspicion I had previously checked this and that it did 7.1 channels okay. The second was that it didn't make much sense for the Panasonic to have 7.1 channel analogue outputs if it couldn't decode to 7.1 channels. So I asked Panasonic and it, in turn, was surprised about my discovery. So I decided to explore further, using the Dolby Laboratories 'Sound of High Definition' test Blu-ray disc. I double checked the settings on the player (Dolby Digital Plus & Dolby TrueHD both set to PCM out). Then I played it. With DD+ the 7.1 tracks seemed to be coming through fine, with my Yamaha RX-V1800B reporting on its signal info screen a format of PCM, sampling of 48kHz and channels of 3/4/0.1. Perfect. But the TrueHD tracks I was playing were reported as PCM, 96kHz and 3/2/0.1 - ie. 5.1 channels. Then I remembered that there are also 'Channel Check' tracks on this Blu-ray disc, so I went to those and played the TrueHD 7.1 trailer and the TrueHD 7.1 channel check. Both of these were reported by the Yamaha as PCM, 48kHz, 3/4/0.1. So, I thought, I have it nailed down! The Panasonic, I figured, can't cope with high sampling frequencies and 7.1 channels at the same time, so if the sampling frequency is 96kHz it switches back to 5.1 channel downmixing. But if it's only 48kHz, then the unit will produce the full 7.1 channels. Or so I thought. Now I've been using a DVDO iScan VP50Pro video processor for the last several months. This does wonderful stuff, such as converting the 1080i output of my Toshiba HD DVD player to 1080p24, and fixing the lousy deinterlacing in some source devices. But it has been a bit buggy (they're working on it), and in particular, despite featuring HDMI 1.3 connections, it won't pass through bitstreams of DTS-HD, Dolby TrueHD or Dolby Digital Plus in undecoded format (nor, for that matter, SACD). So having, I thought, resolved that issue I figured I'd try running the Panasonic multichannel PCM output through it to see if it passed through okay. A new theory: the Panasonic was misunderstanding the capabilities of the Yamaha receiver -- or the latter was sending the wrong information down the HDMI cable -- causing the Panasonic to downmix 96kHz 7.1 material to 5.1. That theory didn't last long either. After the disc had looped through a couple of times, the 96kHz 7.1 track began reverting to 5.1 channels again, just as it had with the direct connection between the Panasonic and the Yamaha. I switched everything off and on again and I was getting 7.1 channels again ... for a while, then it went back to 5.1 channels. More switching on and off. This time, 5.1 channels only. Do it all again, and it's 7.1. It was kind of random. I gave up. The ways of HDMI are indeed mysterious. I shan't be able to resolve this until I get ahold of another Blu-ray player with 7.1 channel Dolby TrueHD decoding. UPDATE (Monday, 21 January 2008, 9:37 am): I've just plugged in a Pioneer BDP-LX70A Blu-ray player. Same behaviour on multichannel decoding as with the Panasonic player. That is, the player converts 96kHz 7.1 channel Dolby TrueHD tracks to 5.1 channels. The Pioneer is capable of delivering all four of the new audio standards as bitstreams, so I can get 7.1 channel TrueHD at 96kHz that way, thanks to the Yamaha's internal decoding of these bitstreams. UPDATE 2 (Wednesday, 23 January 2008, 9:32 am): So now I've plugged in a Samsung BD-P1400 Blu-ray player. This unit also features full decoding for Dolby Digital Plus and Dolby TrueHD, as well as the ability to deliver all four of the new audio standards as bitstreams. This player works perfectly with the Yamaha receiver when decoding 96kHz 7.1 channel Dolby TrueHD material. So why won't the other two?